Massive Summer Slaughter contest launched + album party show draws near. 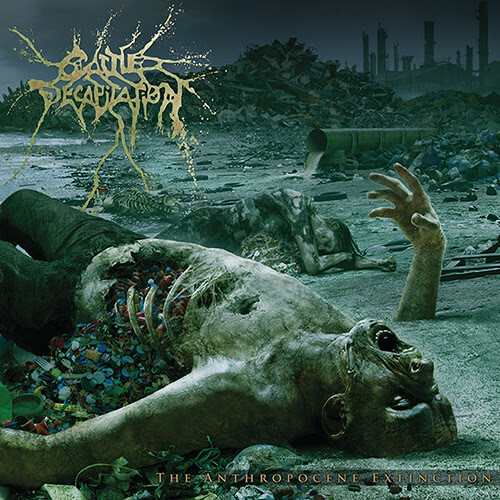 The Anthropocene Extinction is the forthcoming new full-length from San Diego deathgrind icons, Cattle Decapitation. Set for world wide release August 7th, 2015 via Metal Blade Records, the follow up to 2012’s critically lauded Monolith Of Inhumanity was again captured by producer Dave Otero (Allegaeon, Cephalic Carnage) at Flatline Audio in Denver, Colorado, and includes guest appearances from the legendary Philip H. Anselmo, Tristan Shone/Author & Punisher and Bethlehem’s Mr. Jurgen Bartsch. Thematically, with The Anthropocene Extinction we are transported forward to man’s last gasps, reminiscent of what is currently going on with the Laysan Albatrosses on the island of Midway Atoll. The birds and aquatic wildlife of the Pacific Ocean are mistaking the vast amounts of man-made plastic items for food, ingesting it and are dying in large numbers, rotting where they fall and exposing to the world what is happening to the ecosystems of the earth’s oceans – the most unknown and unexplored part of our planet. The breakdown of the earth’s ecosystems has begun long ago due to human interaction as well as the domino effect that will surely seal the fate for our species: The Anthropocene Extinction. We invite you to take a listen to the next track here. Coinciding with The Anthropocene Extinction‘s official unveiling, Cattle Decapitation will appear on this year’s edition of the Summer Slaughter Tour with Arch Enemy, Born Of Osiris, Veil Of Maya, Obscura and more. Slated to commence on July 28th in Denver, the trek will run through nearly two dozen cities, coming to a close August 24th in Los Angeles. Prize package is expected to ship around August 3, 2015. Prize back details and image are available on Metal Blade. Prior to their Summer Slaughter run, Cattle Decapitation will appear at the Brick By Brick in San Diego, California on July 11th to play a special album release party. Joining Cattle Decapitation for the occasion will be Author & Punisher, Noctuary, and Mortuus Terror. Those in attendance will have a chance to win some killer prizes courtesy of Metal Blade Records. There will also be a hosted bar by Sailor Jerry from 8:00pm – 9:00pm. Get in early, grab some drinks and pick up a ticket for a chance to win some awesome swag! If you’re a local or just in town for the infamous San Diego Comic-Con, make your way down to the Brick By Brick – just short ride away from the SD Convention Center! Tickets are available for purchase here. Additional headlining shows prior to and throughout the Summer Slaughter excursion will be announced in the coming weeks. See confirmed tour listing here.